Can a journalist, who is supposed to be impartial and keep their beliefs out of public view, wear religious symbols? 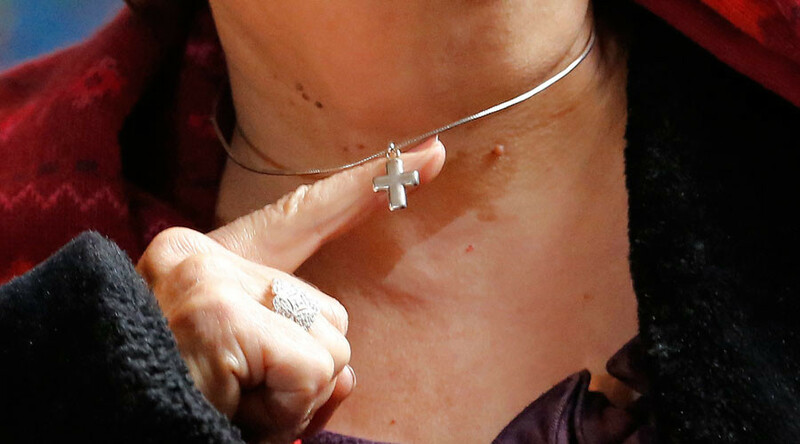 What’s the problem with an Italian presenter wearing a cross? Isn’t it just freedom of expression that atheists are championing? 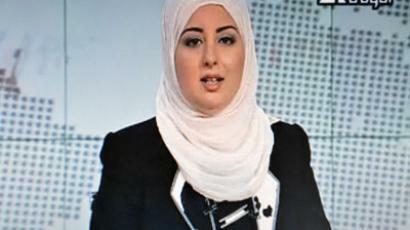 An Italian news presenter has been making headlines herself and all over her choice of jewelry. 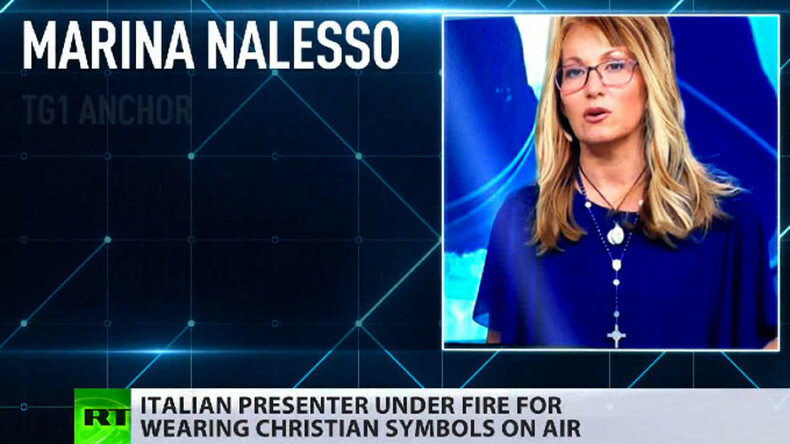 Marina Nalesso, an anchor on channel TG1, has got social media attention for repeatedly wearing a cross as well as other Christian symbols. She says she wears them “out of religious devotion” and that it doesn’t break any of the channel’s policies. RT discussed whether it is against the principles of secularity or whether this is just a part of Italian culture with Dr. Massimo Faggioli, Professor of Theology and Religious Studies at Villanova University, and Dilly Hussain, editor of 5Pillars.co.uk. RT: What’s the big deal about a presenter wearing a cross on air? RT: Some would argue that religion should be a private matter, particularly for a journalist, they should keep their affiliations out of the public eye. What do you think about that? 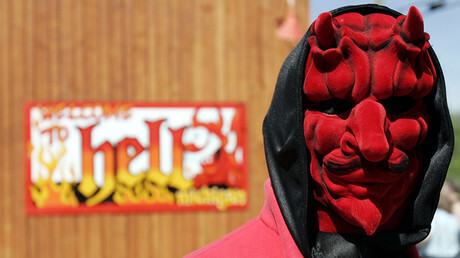 Massimo Faggioli: We all know religion is a personal thing. We are beyond that phase when we saw religion as a private thing. So, one of the things that happened after 9/11, 2001 is that it all redefined the boundaries between religion and secularity, and especially between religion and faith. Many rock-stars wear crucifixes, crosses, not for theological statement but for cultural reason or as a fashion statement. This case should be framed in a logic context of what is the role of religious symbols in a society that is multi-religious and multicultural. RT: Some are arguing that it shouldn’t be a big deal with a cross, in particular, because it is also a fashion item for some people without any religious connation. But in this case in particular, she did wear it for religious reasons. What do you think about the fact that people say it should be private and if you are in the public eye, you should keep those affiliations to yourself? DH: I can understand that very secular point of view but it doesn’t mean I necessarily agree with it. It all comes down to why do religious symbols, especially those of a personal devotion bring in to question ones objectivity and ones quality of the work that they do. And this is reflective and indicative of the increasing aggressive secular nature of Europe as a whole. Italy is overwhelmingly Roman Catholic but the state itself is essentially a secular state. Now the anchor in question has mentioned that she wore it for personal reasons due to her devotion to the Christian faith. If that doesn’t affect her work as a journalist, I see no issue with why it would cause such uproar. And I would also like to add to the point that one of the groups that have been causing a lot of hoo-ha regarding this in social media has been atheists. Now as atheists go around championing freedom of expression, tolerating religious tolerance, they seem to be quite easily and quickly offended by religious symbols. Yet, people of faith are expected to take a backseat whilst having their religion scrutinized to the nth degree. RT: Isn’t it surprising to see such a reaction in Italy, where historically Christianity is embedded into society and culture? How would Italy react to someone reading news wearing a headscarf? MF: It is surprising but not entirely. Italy has a long history of a very complicated relationship between the Catholic Church and the secular dimension. The Pope for centuries was more of a tax collector than the Church’s leader…For a long time we saw atheism as a passive kind of attitude, now we see a militant atheism, which is something new for Italy and for the West as well. DH: I don’t see why there should be an issue with the Italian masses having a problem with a female presenter of Muslim faith wearing a headscarf when we’ve got images all across Italy of Mary, the mother of Jesus wearing a headscarf, wearing what [Muslims] would regard as a hijab…So this is indicative of the rise of a militant form of secularism and atheism which basically sidelines people of faith, religious beliefs as dogmatic, as backward, when this is clearly not the case.